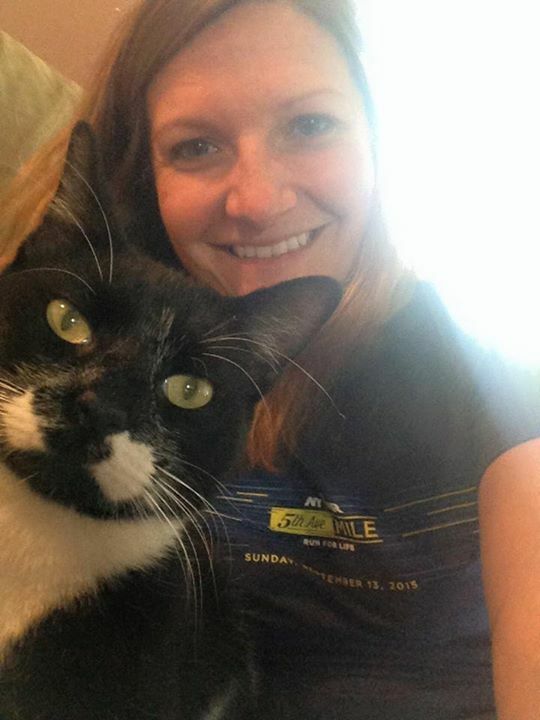 A New Family Member, Training Update, and MEB! First, I want to apologize for being absent so long! Things at work are really heating up, and I’m in the thick of training for both my second sprint triathlon this weekend and my next half marathon on 10/18. And on top of all that, just this past Monday, we finally pulled the trigger and brought in the newest member of the family: Sammy! We first met Sammy a year or so ago, and after sporadic visits for a year, he started showing up every day about a month ago, for a few hours each morning and every night, sitting on our lawn every night waiting for us to come out again in the morning. Once he started showing up with flea bites and chewed up ears, we finally took him to the vet, got him checked out and cleaned up and he’s currently sleeping on the couch next to me! He’s the most loving, sweet-hearted kitty we’ve ever met – he needs to be touching someone to fall asleep, and is my little shadow when I get ready for work in the morning. We’re smitten with this kitten! So on top of the double weekday workouts, 2+ hour runs on the weekends, and crazy work schedule, I also have this new creature to help take care of every day (along with balancing the love for our other cat Lucy who was living here first, and family and friends too)! So needless to say, by 10PM each day I have just about enough time to brush my teeth before falling into bed, so the blog was the first thing to be neglected. My apologies! OK, so that’s my quick update – I hope you all are doing well and your training is going smoothly! We’re in the thick of training and racing season now, so stay strong and trust your training – you’re all rockstars for getting out there and getting it done! Tell me how it’s going in the comments, I want to hear it all! ← What’s in the [Bulu] Box?? Congrats on your new personal best time, Jess! And also congratulations on the newest member of your family — handsome Sammy! I ran the Iron Girl 5K on Sunday, and despite a short course (3 miles), I had a blast! Two more races for me this year, and the goal for the first is to PR. The second is just to have fun and drink all the coffee (It’s the Rook Run)! Good luck to you this weekend! awesome work!! You had a beautiful day for a race 🙂 And those are good goals for the rest of the season – I bet you crush that PR! Meb! Enough said. That’s awesome! Congrats on everything! Well done on the PR! 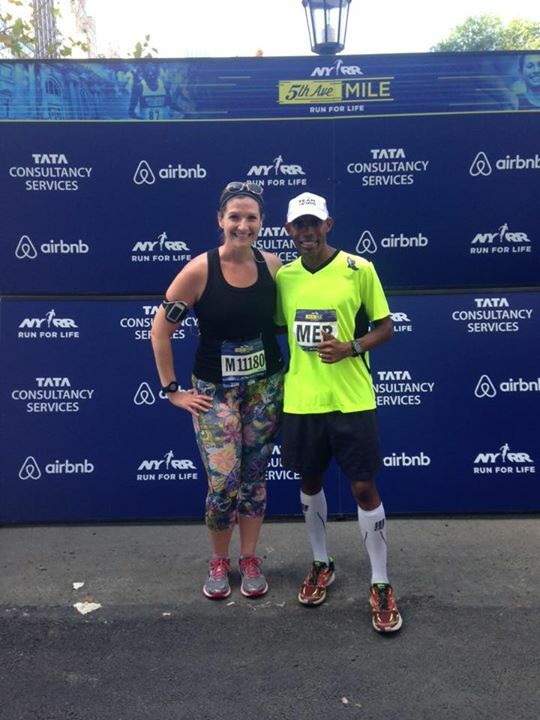 Congrats on your 1-mile PR and meeting Meb. He really is the sweetest person! thank you so much! He totally was – so down to earth and kind, a true legend! Thanks so much! Seaside ran a great race – they were much more well organized, even despite the unanticipated heat. The water table was overrun with people and we had to stop, but they fixed the wait by just handing out whole bottles instead of pouring it into little cups 😉 Overall improvement from last year, I’ll definitely run it again next year! FAN GIRL CITY! That’s so exciting 🙂 So lovely that you took in the kitty face, he needed you! I’m glad training is going well, thanks for sharing! Hey Jess, since you asked, I figured I’d share the details of my bike race last Sunday. The first 16km is all pretty much uphill to the tune of 750meters (2500ft) in elevation gain. I felt nervous at the starting line, having not ridden at all in roughly 17 days, (except for a quick jaunt the day before). Life just seemed to get in the way of the bike, but I knew I could do it. So, off we go, I knew within the first km or so that I wasn’t going to hang on long with the lead group, I’ve ridden this hill part way a couple of times this season, but the thrill of the race had me fighting a bit for my groove, once I set my own pace, it was steady as she goes, so to speak. I rode strong throughout the race. At one point, I upshifted my crank gearset & for some reason, the chain fell off. Pushing uphill at 9km/h, I had to think fast & unclip before certain disaster….. A quick reinstall, & away I went. Funny though, that brief stoppage gave me a burst of energy that had me feeling stronger than before it happened. All was well again, as I enjoyed an almost 9km level/decline, a much needed rest to the legs, I tried to keep the legs moving to hopefully prevent the lactic acid buildup, but just as I started the 10km climb towards the resort, there was a cattle guard looming, I stood up off the seat to cross it, & when my legs got to that extended position, holy leg cramps, batman!! I’d never felt pain like that before on this situation. I couldn’t even unclip, so I fought hard to push through & get them moving again before I would have inevitably fallen over. I got through that, shifted into the easy gear & up I went. The elite racers started 1/2hr after we did, & it took 26km for them to start passing me, & as they did, most had great words of encouragement 🙂 (I felt pretty good about that too). Coming into the village, there was cheering as I neared the finish line. My wife & daughter were there as I crossed the finish line, which too was pretty special to me :). I felt I had ridden a strong race, but didn’t realize how well I did until I looked at my little computer! I was estatic to see 19 mins shaved off my previous time. Once I uploaded my ride to Strava, I saw all the segments had PR’s, which made me even more happy!! My goal next year is to better this time, & I know I can do it :). Sorry this is sooooo long winded, buddy. (I hope you don’t mind)…. WOW, what an adventure you went on for this race! I totally love it, what an awesome way to share your story… great work on taking so much time off of your old time, kudos!! And my heart skipped a beat when you mentioned your chain slipping – that almost happened to me during my race this past weekend and I thought I would cry!